SARMS1 have been trading for around 3 years and they have made their mark already with a firm somewhat untouchable reputation in the world of research chemicals. They claim that during their relatively small history they have served over 10,000 satisfied customers. We have received many requests asking for references/reviews of SARMS1 and we have now managed to gather enough data to provide an honest review of this company. This is to be our first introduction to SARMS or known in full as Selective Androgen Receptor Modules. Over the coming months we will be publishing more reviews of both SARMS companies and also the individual types of SARMS most commonly used in bodybuilding and other sports etc. Based within the US, SARMS1 is one of many retailers that have emerged over the last 5 years to provide quality chemicals for research purposes. They ship both within the US and also international shipping is available. To avoid potential shipping problems SARMS1 will split the consignment into 3 bottles per shipment. The cost of shipping this way is $27 for the first package and $25 for each further package. Ordering from SARMS1 was surprisingly easy and straight forward. New customers will have to register themselves on their website prior to be able to place their first order. This took an average of below 2 minutes. The availability and range of SARMS was what one would expect and what they stock are the most in demand types, LGD-4033 (Anabolicum), Mk-677 (Nutrobal), Mk-2866 (Ostarine), S4 (Andarine) and GW-501516 (Cardarine). 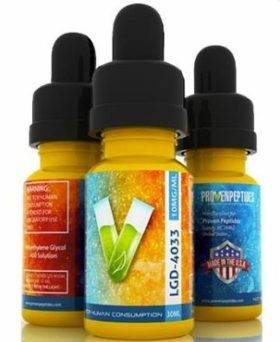 I was lucky to find some great discounted offers on a few of their products, for example I got Anabolicum (LGD-4033) – 10mgs/ml 30ml for $99.99 rather than the normal price of $249.99. There were a few other discounts at the time of ordering but I just wanted to test the water, excuse the pun! I have since taken advantage of the sarms1 coupon code to get even more discounts. Delivery time was just as they state and my order (within the US) took only 4 days to arrive, even though they say between 5-7 days on their website. The quality and standard of the packaging was excellent and it was without any company or product information printed anywhere on it. I couldn’t have asked for better on this part of the order. I started my course of my SARMS1 order and at first I was a little dubious, mainly because a friend had told me that he had used SARMS1 and he suffered some unpleasant side effects. I decided that as I had bought the stuff I was determined to try it. I had some advice on how much to take and how often. I was happy to find that I suffered no side effects whatsoever apart from some tiredness on the first evening. The taste though was something else and I found it hard to swallow at times. I stuck to Ostarine to start with and I had amazing results with it. I have since placed further orders with SARMS1 and each time they have fulfilled their promise and I’ve been highly satisfied with their efficiency each time. Price of products: 6/10 without discount, 10/10 with sarms1 coupon or sarms1 coupon code. Would I order from SARMS1 again? Yes, without a doubt! My overall experience with SARMS1 was no less than I would expect from a company that I would be spending $100s with. Their approach to satisfying the customer was very good and the quality provides was the same.